Key difference: The unique aspect of Lenovo Thinkpad Twist is that it is a convertible laptop with the ability to twist its screen and fold back. This allows the device to take up four design modes. This includes Laptop Mode, Tablet Mode, Tent Mode and finally, Stand Mode. The Lenovo Thinkpad Twist features a 12.5 HD IPS display with Touch Sensor of Magnesium Alloy Construction with Corning Gorilla Glass. It is powered by Intel Core, and is actually available in three variants. The Microsoft Surface RT is a tablet that features a 10.6-inch TFT HD capacitive touchscreen with approximately 148 ppi density. The screen affords the true 16:9 aspect ratio. However, the OS is not compatible with old Windows PC programs. Lenovo Group Limited is a Chinese multinational with its operational headquarters in Morrisville, North Carolina. The company provides computer hardware and electronics, including personal computers, tablet computers, mobile phones, workstations, servers, electronic storage devices, IT management software and smart televisions. Among other things, the company is especially known for its computers, especially the ThinkPad and IdeaPad line of notebook computers. The Lenovo Thinkpad Twist is inline with its ThinkPad series, which is known for its durability, long life and easy availability of replacement parts. In fact, laptops in Lenovo Thinkpad series are currently the only laptops certified for use on the International Space Station. The unique feature of Lenovo Thinkpad Twist is that its screen and CPU is attached with a single twistable hinge that gives the device the ability to twist its screen and/ fold back completely. This feature gives the device versatility and allowing the user to use the device as either a laptop or a tablet. It also allows the device to take up to four design modes: Laptop Mode, Tablet Mode, Tent Mode and finally, Stand Mode. Hence, the device is effectively two-in-one, a tablet and a laptop. The Lenovo Thinkpad Twist features a 12.5 HD IPS display with Touch Sensor of Magnesium Alloy Construction with Corning Gorilla Glass. It is powered by Intel Core, and is actually available in three variants, Intel Core i3/ i5/ i7. It has up to 8 GB RAM which varies as per the processor. The Thinkpad Twist runs Microsoft 8 as its OS, and has either 320 GB or 500 GB of hard disk memory, as well as 128 GB of SSD or solid-state drive. The SSD works to improve application load times and system boot times. 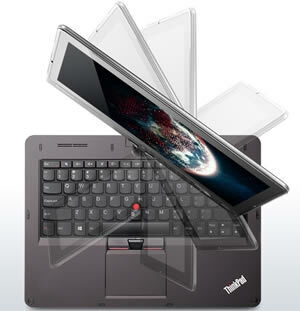 The Lenovo Thinkpad Twist is a follow-up to the company’s popular IdeaPad Yoga line. Other than provide the durability of a ThinkPad over the IdeaPad, it also aimed to improve on a feature of the IdeaPad Yoga series. The IdeaPad Yoga series are also convertible laptops, however in order to get to the tablet mode, the screen folds back, which leaves the keyboard exposed on the back of the tablet. This makes holding the tablet, a little awkward. The ability of the Lenovo Thinkpad Twist to twist its screen 180 deg before folding back addresses this issue as the twist allows the screen to cover the keyboard. However, the device has been criticized as being too heavy to be used comfortably as a tablet. Microsoft, which was originally a Desktop manufacturer, has now shifted focus on creating smartphone operating systems, laptops, and even tablets. The Microsoft Surface RT was launched in November 2012. The Microsoft Surface RT is a tablet that features a 10.6-inch TFT HD capacitive touchscreen with approximately 148 ppi density. The screen is pretty decent in terms of resolution and shows clear, sharp images. The screen affords the true 16:9 aspect ratio which matches most movies and shows, eliminating the black bars that pop up. The tablet runs on the Windows OS, but has a huge lacking feature. The OS is not compatible with old Windows PC programs such as VLC, Photoshop Elements, etc. This is one of the reasons for the tablet not being so popular even after the amazing design and other attractive features. In order to run the old PC programs, one would require Windows 8 with an Intel processor, which is offered in the Microsoft Surface Pro. The device has a slab form that makes it look thicker and heavier than it actually is. The device is only 9.4 mm thick, same as the iPad; however, the slab form that has not been tapered towards the end makes it seem thicker. The tablet is a little heavier compared to other devices because of the extra inches on the screen. The device is quite slick, which makes it easier to grip but more prone to slipping through the fingers. The device comes with a built-in kickstand that helps it stay upright when placed on a surface. The device is covered in a VaporMg casing, which according to the company, makes the device scratch and water-resistant. The device also has an intriguing feature, which is a cover that doubles as a keyboard. The sleek and flat keyboard has an aesthetic appeal and is also productive. On top of the device when facing front in landscape mode, there is an ambient light sensor along with the front facing 1.2 MP camera. On the bottom bezel is the Windows Home sensor that takes the user to the start screen or the last app accessed. On the right side of the device, there is a speaker grille, a Micro-HDMI port, a full USB 2.0 port, and the power port. The left side has an additional speaker grille, a headphone jack, and a volume rocker. The kickstand is said to be a bit difficult for some people, while other claim that the stand was pretty smooth and easy to access. Under the stand, resides the microSD port, while there are magnets on the bottom to attach the Touch and Type keyboard covers. The device also has a 1.2 MP rear camera, in case anyone would like use it take photos. The tablet is powered by a 1.3 GHz Quad-core Cortex-A9 and comes in 32 and 64 GBs variants. The device feature 2 GB RAM. The processor provides enough power to allow the swiftly shifting between apps and windows. The tablet supports 802.11 a/b/g/n Wi-Fi support, Bluetooth 4.0, a gyroscope, an accelerometer, and a built-in compass, but no GPS. The device houses a 31.5 W-h battery that drained pretty quickly according to CNET. The main problem that comes with this device is that it is less of a tablet and more of an even more portable laptop. 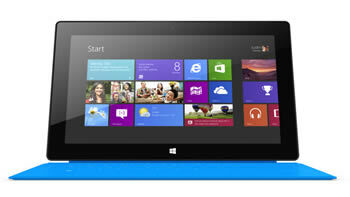 The design is obviously appealing, but in terms of features and price, maybe going for Microsoft Surface Pro. The information for the detailed table about the two devices has been taken from the Lenovo website, the Microsoft website and GSMArena.com. Wi-Fi, Wi-Fi direct, Bluetooth, USB.